Don’t miss the other bellingFAM Drinking Games for Parents, including the ever-popular Homework Drinking Game and the must-needed My Daughter is a Tween Drinking Game. Someday, I’ll tell you about my time in the PTA. Here’s what I’ll tell you in the meantime: If there is every a parent-related organization that will drive you to drink, this is it. I don’t usually drink during the week, and rarely on the weekends even (weird, RIGHT? ), but ohmygod, I was a serious have-three-drinks-on-a-Tuesday-night kind of drinker during my year on the PTA board. Then, replace Tuesday with EVERY OTHER NIGHT OF THE WEEK. I’ve entertained the idea of opening a rehab that PTA board members can go to straight after serving their time. Make that a rehab/witness protection program. With yoga. And silence. Lots of silence. For every year that you’ve been on the PTA. Take two drinks for every year you’ve been a board member or served on a committee. If you show up late and have to sit in the front. If you show up late and there aren’t any chairs left, so you have to unfold a super-creaky metal chair from off of the chair rack. For every kid you had to bring with you to the meeting. One drink for each school-aged kid. Drink double if you brought a toddler. If your cell phone rings in the middle of the meeting. Take another drink if your tween daughter changed your ringtone to a Ariana Grande song. Every time you vote on something. For every time you volunteer to help with something without fully realizing what you just volunteered to help with. Every time another parent makes some grandiose suggestion without having any idea of how to implement it… and without volunteering to head it up themselves. When someone forgets to second a motion. If you’re a PTA member as a parent and a teacher. Any time someone says “Box Tops.” Drink again if you’re the Box Tops coordinator. If you’re pretty sure you turned in your membership check this year. For the following PTA-related phrases: Nomination Committee, engagement, bake sale, Sign-Up Genius, jog-a-thon. If you’re looking at the budget spreadsheet and have no clue what it means. Drink again if you raise your hand to vote to approve it anyway. 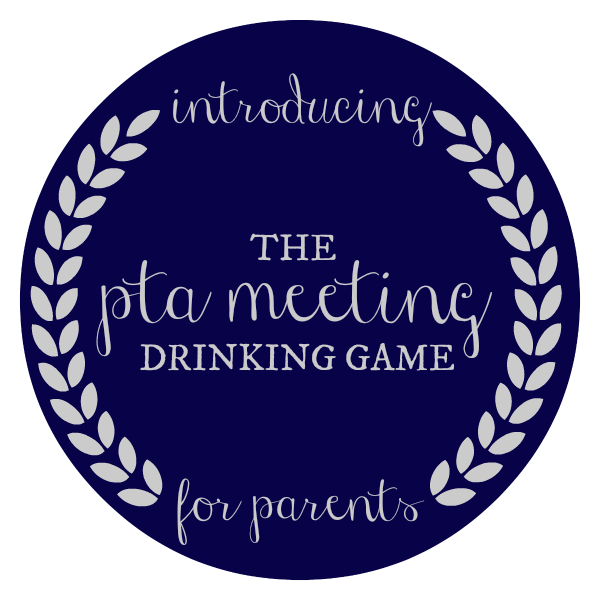 What would you add to the PTA Meeting Drinking Game for Parents? Leave them in the comments so that we can add them (with credit…)! This entry was posted in Drinking Games for Parents and tagged 2014, Drinking Games for Parents, PTA, School Days on November 13, 2014 by Katie Kavulla. If you are a parent with an infant (3 mos old) who was called and asked to attend at the last minute and then nominated to be in charge of organizing and recruiting volunteers for the school carnival (infant in tow).